In my last article, we talked about Value Objects, domain model elements with no conceptual identity. We said that Value Objects represent descriptive aspects of the domain and are fully defined by their state. This month, we will review the options for loading Value Objects into memory. You can create a Value Object by calling it's constructor or factory. This is a very simple method but there is a catch: since Value Object are immutable, you need to know all their required attributes at the moment of construction. Example: Creating an instance of the Address class based on a submitted HTML form. If you need a Value Object in your code, who could you ask for it? Since Value Objects are often descriptors, you may be able to query objects their describe (usually Entities or other Value Objects). Example: asking Person Entity for the Person's Age or asking Email Address Value Object for it's Domain. 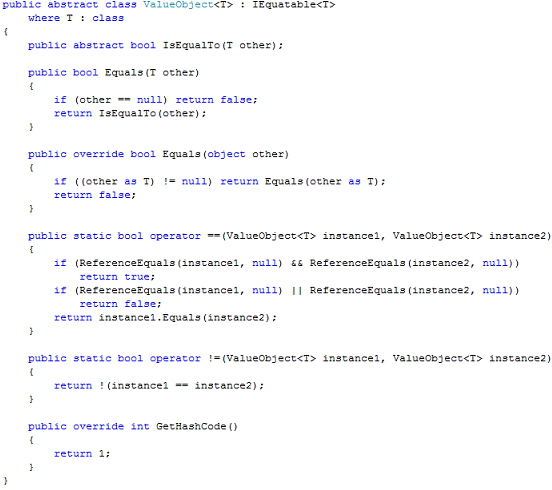 Another popular way is to obtain a Value Object as a result of an operation call closed under the Value Object interface. Example: (new Money($10)).Multiply(2) results in new Money($20) or Color.Blue.Mix(Color.Yellow) returns Color.Green. 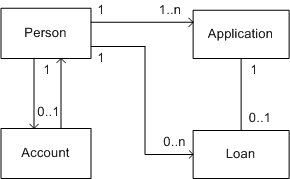 As discussed in my previous posts, Value Objects are tracked only as part of Entities they describe, in which case they are loaded into memory using Option 2. Value Objects are not recreated from previously stored states. However, there is a situation when Value Objects need to be created independently. For example, it is a fairly common requirement to display the list of Value Objects in a drop-down list. Example: User submits a new Purchase Order. As part of the entry screen, the user chooses Billing and Shipping Address for the new Purchase Order. All 50 States are selectable on the Billing Address form, but only 48 States are selectable on the Shipping Address form. How shall we populate drop-down lists of 48 and 50 States for the New Purchase Order screen? I have heard software designers making arguments towards promoting State to an Entity. Then, State Repository would be responsible for retrieving the right lists of States to display in each situation. I disagree with such design. It introduces a responsibility of managing States into the domain model, which can be easily avoided if we keep States as Value Objects. Another important point against introducing the IStateRepository interface is that business rules of whether to display a particular State in a drop-down or not do not belong to the State class. For example, the company could introduce a new Product, which could be shipped to all 50 States. My preference is to assign the responsibility of knowing about Value Object lists to aggregate repositories. In our example, IPurchaseOrderRepository would have FindStatesForShipping and FindStatesForBilling methods. Last time, we continued a discussion around how to organize classes inside your domain model. We defined important domain model elements: Entities, aka Reference Objects, and looked at their relationships. This month, we will review the options for loading Entities into memory. The option #1 is usually implemented via a constructor or a factory. It works well when you need to create a new entity object, not yet tracked by the application. As we discussed last month, Entities span through long periods of time and run across multiple systems. Unless you are writing a data entry application, you are going to work with existing Entities a lot more often than with new ones. When you need to create an existing Entity, use the option #2 or the option #3. Let us take a look at the last month's example: User logs in into the system to check the status of their loan applications. Assuming we have a Person loaded, how shall we obtain their Applications? To enable the option #2, design the Person class with a method or property that returns the Person's Applications. I generally prefer to pass a qualifier, such as loan type or date, that would transform one-to-many relationship between Person and Application into one-to-one with a qualifier, but this is a topic for another conversation. For now, let us assume that the Person class defines the Applications property that returns a list of Applications. This requires you to either get the Applications when the Person object is loaded into memory or implement a lazy load mechanism to defer loading Applications until the Applications property is called. To enable the option #3, design the ApplicationRepository class with a method that returns a list of Applications for a given Person: "IList FindByPerson(Person person)". My preference is to place repository interfaces in the model and move repository implementation into a separate Persistence library. Keeping repository interfaces in the model helps clients understand how entities are supposed to be loaded into memory. Having repository implementation separate from the model keeps the model free from infrastructural detail. In August, I blogged about the structure of a release unit's trunk folder. We looked at how to organize your .NET solution to support principles of object-oriented and domain-driven design and distributed application development. We recommended creating a separate library for domain model classes that would describe your release unit's capabilities in business terms. This month, we are starting a discussion around how to organize classes inside your domain model in a clear, easy-to-understand and, thus, easy-to-maintain manner that supports natural growth of your applications. The topic is quite large and will take a series of articles to cover even at a very high level. The purpose of this article is to introduce you to the topic and provide basis for our discussion over the next few months. Learning that occurs during the project is ignored because it is not a part of the original plan. Communication between users and stakeholders and the development team is poor. Very limited creativity takes place. There is almost no place for new ideas. As a result, the system is created lacking flexibility and understanding of the domain. To get the most out of your projects, enable continuous functional and technical learning for all your team members. As they learn more, they will make decisions better and faster. Big Design Up Front (BDUF), in which design decisions are perfected before the implementation is started. Adhoc Evolutionary Design, in which design decisions are made as the system is being developed, but without a set of rules that would ensure domain model consistency. As your team acquires new knowledge, their understanding of the domain changes. Even if you start with BDUF, the domain model needs to evolve in order to correctly represent your understanding of the business situation. As your domain model evolves, it becomes more powerful and sophisticated, requiring you to establish rules and guidelines around it. Without overarching rules, constant changes to the model will make it inconsistent and hard-to-understand, eventually leading to a familiar "fast-slow-stopped-redesign" application development cycle. What business processes are enabled by this system and what are their steps? What business transactions are supported and how are they implemented? What business concepts do we deal with day-to-day? How are they described? How can they be created and loaded into memory? What operations are performed? What decisions do we face? What business rules could be customized and how are they configured? Business rules and operations are often the most sophisticated and the most changeable classes in the domain model. But most importantly, these classes have a great potential to add a hidden business value. Make them explicit and extendable in your model to uncover their true power. If you are new to domain-driven design, please, refer to this book to get started. There is plenty of information online about the object-oriented principles. They are a great way to maintain a clear, flexible, reusable, and robust codebase and keep infrastructural details outside of the domain model. This article started a discussion around how to organize your domain model. We have reviewed the objectives and discussed why they are important. Next time, we will look closer into designing domain model in practice. I am happy to announce a new monthly column called "The Architect" where we will touch on many issues facing designers and developers creating object-oriented business applications. I will share with you rules, principles, and techniques that I found useful over the years. I hope you will be able to identify with the problems described and will take pleasure in learning from the situations that apply to you. We have a wide scope to cover: object-oriented analysis and design, domain modeling, design patterns, domain-driven design, responsibility-driven design, service-oriented architecture, etc. If you are a member of a development team, or if you work with software developers, this column is for you.